**This book can be read as a stand-alone apart from the first book in the series, Origin. In fact, there is some dialogue alluding to the South American facilities, another research group owned by the fictional company of Corpus, which, if I'm not mistaken, is where the events of Origin takes place--possibly concurrent to the events of Vitro. I am actually quite conflicted with whether or not I liked this book. In the end, I can only say that I found it entertaining and gripping, maybe enjoyable. However, really liking it is a bit of a stretch. The story's progression was consistently forward moving without any room for breath--there was constant action and constant activity, and everything was just moving so fast you don't get much of a chance to think about anything. Jessica Khoury's writing is great and the premise of Vitro, an attention-grabbing idea. Certain controversial subjects are raised, and the story can be quite thought-provoking. But aside from that, there wasn't much that stood out about Vitro to make it a memorable book. While the characters were great, there is nothing memorable about them nor about their stories. Sophie Crue has looked forward to working with her scientist mother on Skin Island her entire life. Ever since her parents split up and she was whisked away to Boston to live with her father, Sophie has desired nothing but to prove to her mother that she can be useful and can help with her mother's research of finding cures for certain human ailments such as Alzheimer's. So when she receives an urgent e-mail from her mother asking for her to come to Skin Island because Moira Crue is in distress and needs Sophie immediately, she does not hesitate to fly all the way out to Guam where she hires a young pilot, Jim Julien (an old childhood friend of hers before she moved to Boston), to take her to Skin Island. But upon arrival, the duo realize that there is something much more sinister happening on the isolated island. Instead of researching to find cures for Alzheimer's, Sophie finds that her mother has been creating Vitros: young, teenage children artificially born and grown, with chips embedded in their brains who are programmed to imprint upon the first person they see upon awakening, and thus will become a slave to that person. Moreso, Sophie discovers Lux, one of these Vitros, who is her own twin sister. There were just a few things here and there that did not work for me: mainly a lot of Sophie's actions that get her onto the island in the first place, and some of the sci-fi logic surrounding the creation of these Vitros. Not that I'm a scientist or anything, so I just went with it and enjoyed the horror-like aspect of the sci-fi part of the story. As for Sophie's actions: Had she not been so reckless and naive to begin with, I might have enjoyed the book a lot more. But I found her actions maddeningly stupid. While I understand that she's been wanting to be with her mother for all these years and takes the first chance she gets to run off to Skin Island, I can't help but think that someone more level-headed would have thought things through first before flying across the world based on a single e-mail SOS from a mother who has denied her requests to visit Skin Island for so many years. On top of that, while I don't begrudge her getting into a plane with Jim Julien because he IS a childhood friend, and as she states, her only ever closest and best friend, she also has not seen this boy in over ten years. HOW do you know he's still that same friend and trustworthy enough to climb into a plane with him and rush off into the air where he has full control over where you are going and where you will end up? And THEN, by the third chapter, Sophie once again runs off with another strange boy she DOES NOT EVEN KNOW when they land on Skin Island. Nicholas just shows up, says a lot of cryptic things, doesn't even acknowledge whether or not he is taking Sophie to see her mother, and Sophie just goes with him without hesitation. Honestly, change the way the events at the beginning took place--get Sophie and Jim to Skin Island in a different way with some more tangible reasons, and I might buy into the story a little bit better. But after three very bad decisions, I started becoming wary of everything else that Sophie did such as continuing to trust Nicholas and trying to help him despite the fact that he'd lied to her, sabotaged Jim's plane, and got her stuck on Skin Island. At the halfway point of the book, when secrets start coming out and the entire island starts becoming chaos and mayhem, things started getting MUCH better. And to be honest, Jessica Khoury's writing is spectacular in laying down the foundation of a world and creating excellent imagery of the island's setting. The story concept was also intriguing, and the characters were all pretty awesome. If not for the few bad decisions that Sophie makes, which seem highly illogical, I might have liked this book a lot more. The character interactions were kind of meh, though. Aside from the whole "childhood" friends memories to go on, the friendship bond between Sophie and Jim was a little flimsy. So it's fortunate that Jim's got a good altruistic hero complex going on for him and couldn't abandon Sophie, putting his own life in danger time and time again to help her and Lux. But otherwise, even for a friendship, their tight bond felt a little forced. It makes me a little glad that the romance was so back-seated that it might have been non-existent. And I'm okay with that, really. I had had stars docked from this book's rating for quite some time until halfway into the book and things started getting exciting and the story world's events and logic felt a bit more stable. 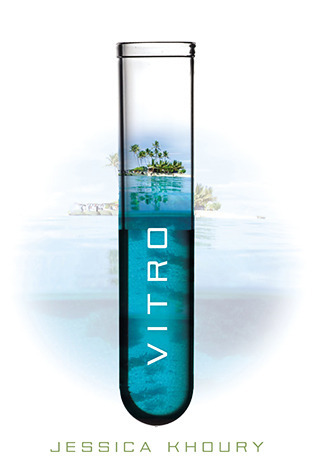 Vitro can be an entertaining and enjoyable read. I didn't like it nearly as much as I liked Origin, but it IS serviceable as an action-packed, fast-paced, science fiction. This review was originally posted at Ani's Book Abyss / BookLikes in December 2015. I liked this book but I agree with your thoughts about some of her actions, especiall re: Nicholas. Yeah I get she's desperate to see her mom, but still. It's definitely fast paced and I liked that, you're right once it gets going it doesn't slow down a bit! And I did think she evoked the island setting very well- that was one of my points when I reviewed it. Felt like I was there. But I agree with a lot of this. Jessica Khoury has an excellent way of creating vivid imagery in her settings, which is one of the reasons I've been enjoying her books. If it weren't for those few moments with Sophie's actions, and a few other things that bugged me, this book would be darn near perfect, because I DID really enjoy the premise with the Vitros. Top Ten Tuesday: Books Make Me Do Things! My TBR List -- July Winner!